Everyone believes that children have the ability to learn language and that they should be taught to speak, read, and write. When given the proper environment, every child has the ability to learn music. It goes without saying that parents play an essential role in teaching their child to speak. The parents’ role in a child’s musical education is equally vital. Suzuki spoke of a triangle between the student, teacher, and parent, in which each member must contribute equally. Being part of a Suzuki program requires a commitment on the part of the parents. Parents’ responsibilities include observing their child's lessons; guiding daily home practice; providing opportunities to listen to music every day (especially the Suzuki repertoire); and enriching the child’s musical environment by attending concerts together. Children are immersed in language from the moment they are born. While it is never too late to begin learning an instrument, being exposed to music from a young age greatly facilitates learning. Children learn to speak by imitating the sounds in their environment. Listening to music every day is essential to develop an awareness of the “vocabulary” of music: a beautiful tone, accurate rhythm and intonation, phrasing, and musical expression. When children begin to speak, their efforts are met with enthusiasm and wonder. Parents never scold a child for mispronouncing a new word; instead, the child is encouraged to repeat the word over and over until it is mastered. An equally positive environment is necessary for a child to learn music. Children learn to read and write only after they have achieved the ability to speak with ease. 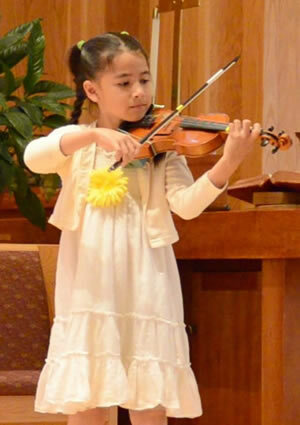 Similarly, Suzuki students learn beginning repertoire by ear, enabling them to concentrate more fully on the sounds and physical skills involved in playing the violin. The way music reading is taught within the Suzuki Method varies considerably from teacher to teacher. I strongly believe in the importance of teaching reading as early as possible. Therefore, while I teach the beginning Suzuki repertoire by ear, I simultaneously teach the fundamentals of reading. These separate elements gradually merge into a strong and cohesive whole. Just as a child must repeat a word many times before it is mastered, repetition is imperative to learn the skills involved in playing the violin. In general, children remember the new words they learn and eagerly use them. 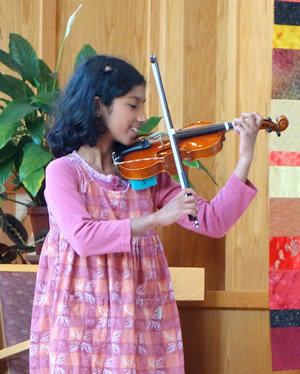 In a similar manner, Suzuki students continue to practice the repertoire they have learned. This reinforces technical skills, develops memory, and provides opportunities to experiment with musical expression. Most importantly, through continued review, students become accustomed to the feeling of playing with ease.